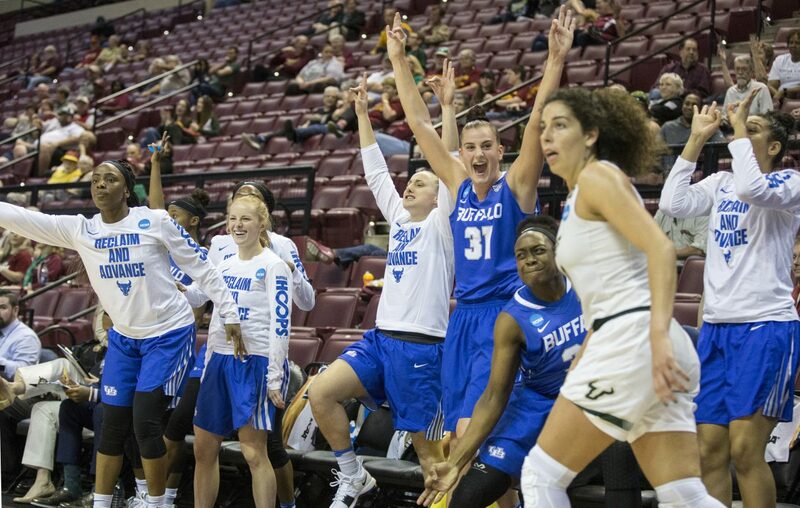 TALLAHASSEE – The historic postseason for the University at Buffalo basketball programs continued Saturday afternoon. 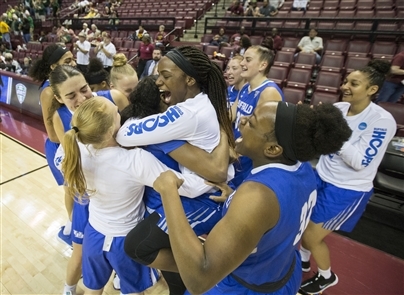 This time, it was the women's program which earned its first NCAA Tournament win. The No. 11 Bulls upset sixth-seeded South Florida, 102-79 in Tucker Center. Cierra Dillard had a career high 36 points, including a career-best seven 3-pointers, while Courtney Wilkins poured in 23 off the bench. Slow start for Buffalo: The first quarter was smooth for South Florida and rocky for UB. Maria Jespersen was stroking her shot to perfection, netting 13 points in the opening 10 minutes hitting 4 of 6 from the field. Buffalo was shooting just 33.3 percent from the floor (5 of 15) and were getting pounded on the boards, 12-6. Still, South Florida held just a 20-11 lead. Second quarter spurt: Buffalo's defense was on fire in the second, scoring 17 points off eight South Florida turnovers. They shot 61.9 percent in the quarter, hitting 13 of 21 shots including knocking down six 3-pointers. Senior point guard Stephanie Reid found her game, and her teammates. While she had a few impressive drives to the bucket, she drew attention and dished to her teammates who were hitting from outside. Courtney Wilkins dropped 11 points in the second quarter, including hitting 3 of 4 from 3-point range. Cierra Dillard knocked down a 3 at the buzzer to give her 15 points and Buffalo a 43-38 lead at the half. Taking charge: Buffalo came out of halftime where they left off. Dillard hit a three-pointer that sparked a 10-0 run. A bucket from Wilkins put UB up by 16, 56-40, with 6:33 left in the third quarter. Buffalo would lead by as many as 17, 63-46, but South Florida hit 8 of 8 of their field goals late in the quarter to trim UB's lead to 71-58. Up next: The Bulls advance to the round of 32 for the first time in program history. They will face host school Florida State, which won its first-round game 91-49 over Little Rock, at 6:30 p.m. Monday in the Donald L. Tucker Center.